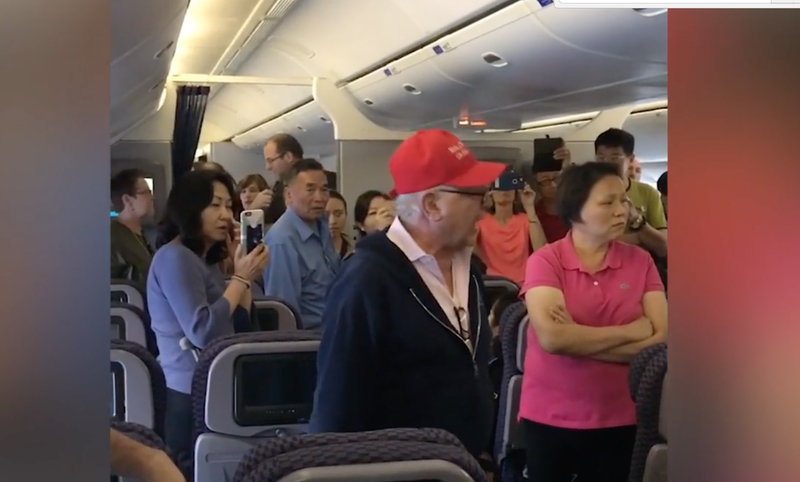 According to the Washington Post, the man, who was wearing a “Make America Great Again” hat, started becoming confrontational as he stepped onto the plane. “Obviously, the hat provoked some of the stuff,” Alexis Zimmerman, who was flying back to Newark, N.J., told the Post. The apparently entitled man took an aisle seat three rows ahead of her and refused to let anyone sit next to him, she said. In video taken by Zimmerman, the man is seen with his hands folded behind his head and his feet propped up on someone else’s armrest, while a woman using crutches and several others take photos and glare at his inconsiderate behavior. “You’re a selfish man,” the woman with crutches can be heard telling him. “He wanted to sit in the whole row by himself,” Zimmerman told the Post. According to Zimmerman, the man claimed to be diabetic, and at one point, according to passengers, he dared the flight crew to put him in cuffs and drag him off the plane—an admitted sharp barb at the embattled airline. However, the crew in Shanghai remained cordial and patient, passengers told the Post. According to Gredoña, he also picked on a female passenger. “I think he called her Hillary. Then he called her a lesbian. I think he called a stewardess ‘sweetheart,’” he said. The man became “increasingly disruptive when asked to deplane,” to the point that “local law enforcement was called to assist,” a United spokesperson told the Post in a statement. However, that proved futile, and so every other passenger ended up having to go back into the terminal while waiting for officers to remove the man from the plane. As the man was seen back inside the terminal, shouts of “Lock him up!” began spreading through the crowd. It was not clear whether Chinese police actually did lock up the man.